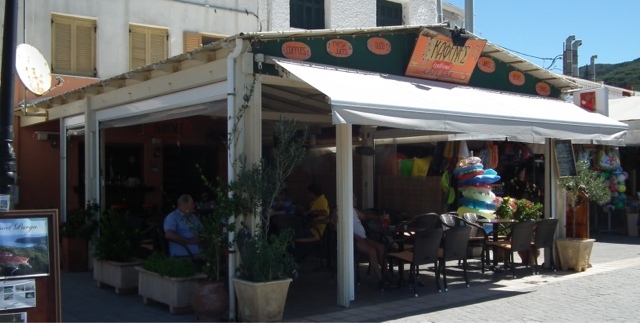 Two down from the Bacchus Taverna along the harbour front is the Kafenes bar run by the very friendly Elpida Liakri. Like many along the front it's a nice shady spot for people watching as everyone wanders past and has a lovely view of the castle and island. Other than the welcome, one reason I like this bar above many of the others is simply that the seating is a little more comfortable than a few of the others along the front that go more for style. Little mezze plates of toasties are often brought out which sometimes causes a little panic to new customers who think they are going to end up with something on their bill they didn't order. But this is random, as and when it's not busy, so don't expect a mezze with every drink, but it's a nice snack when they do arrive.